Sheryl Sandberg was married to Dave Goldberg for 11 years when she found him lying by an elliptical machine in a small pool of blood. They were on vacation in Mexico celebrating a friend’s 50th birthday when Goldberg went to the resort’s gym to workout. His heart failed. When Sandberg found him, his face was already faintly blue. And so begins Sandberg’s heart-wrenching nosedive into widowhood and her indefatigable quest to help her two young children heal, and ultimately thrive, in the face of this family-altering loss. What she learns about rebounding from adversity (unimaginable setbacks of all kinds, not just the death of a loved one) becomes the uplifting backbone of this book. One of the most essential takeaways is the healing power of community. 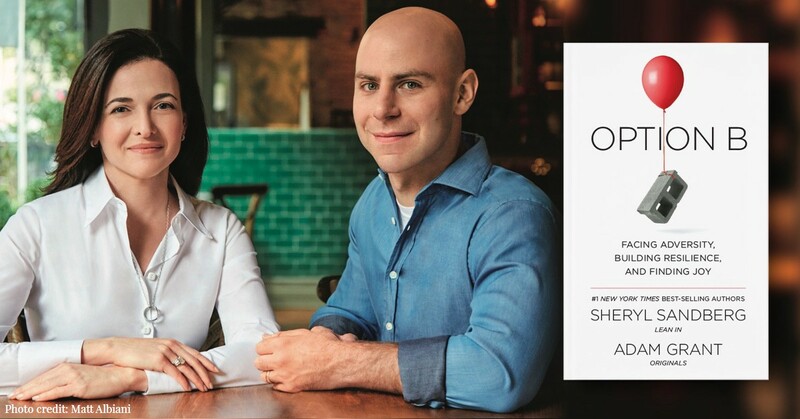 Community, Sandberg and her co-author Adam Grant argue, gives us the strength we sometimes can’t find by ourselves. This is true, and why I relish hosting Memory Bashes for hospitals, hospices, funeral homes, and religious groups across the country. A Memory Bash is an excuse to get together as a group — eating, drinking, having a good time — while celebrating loved ones who have passed away in the company of others drawn to do the same. It’s a joyful concept I write about in Passed and Present: Keeping Memories of Loved Ones Alive. Participants learn new ways to preserve a loved one’s handwriting. They share stories. They create Memory Magnets, a quick no-mess project that enables the easy display of cherished photographs when they get home. And every Memory Bash ends with a commemorative toast — a group of new friends forming a circle, raising their glasses high, with each person taking a turn to say their loved one’s name out loud. Sandberg’s writes it’s not been easy to replace her outsize grief with feelings of joy and gratitude. It’s been a gradual and ragged journey, and she’d trade every lesson learned to have Dave back. But Option A is not available. The best she can do (and the best we can all do) is crush Option B. Giving yourself opportunities to receive support from your family, friends, and community helps. Originally published at allisongilbert.com on April 24, 2017.